Today, I'd like to share an extraordinary dessert that has haunted me ever since I first tasted it: Town Hall's Pot de Crème. This decadent sweet ending is an uber-luxe version of an American classic -- creamy butterscotch pudding layered over rich dark chocolate pudding, topped with shards of buttercrunch toffee. Best of all, it's served in a huge oversized cereal bowl. No wussy servings here. I shared this bowl of pudding-liciousness with some gals who have as much appreciation for the cook's holy trinity (butter-sugar-cream) as I do. 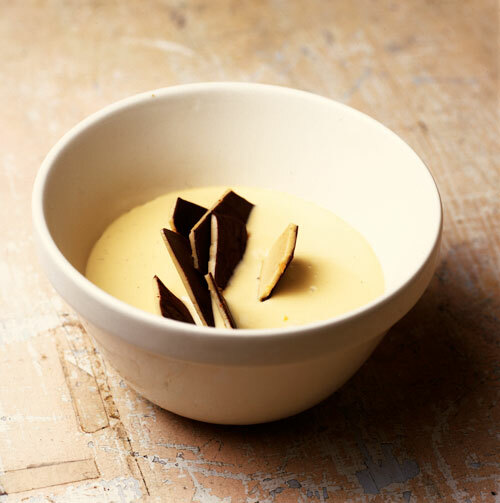 This Pot de Crème had us oohing and ahhing until we were scraping the bottom of the bowl. I decided then and there that I needed to learn how to remake this at home. The real knockout part of this dessert was the Butterscotch Pudding, so I decided to focus on that. I went to work trying to recreate this lovely bowl of sweetness. My first attempt was meh. I melted my dark brown sugar and butter together, and did everything David Lebovitz told me to do, but the texture was too grainy. Plan B: Go to the source. I emailed Town Hall and begged them for the recipe. To my utter delight, they happily shared it! I scaled down the recipe, but otherwise, followed the instructions closely. In a sauce pan over medium heat, combine the cream, salt, and vanilla bean (The one I used was home-grown by my friend in Madagascar!). Bring the cream to just under boiling (small bubbles should rise to the side, but no rolling boil). 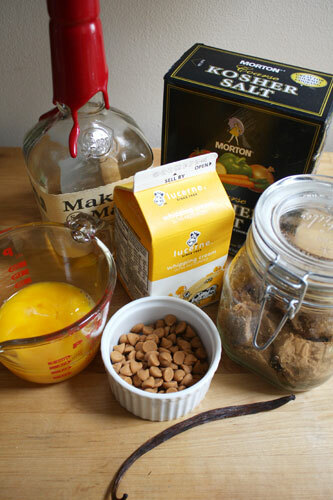 While the vanilla cream mixture warms up, whisk together the scotch (or bourbon), water, brown sugar, and second measure of cream. Set that aside. When the cream mixture is done, turn the heat off the pot, fish out the vanilla bean, and stir in the scotch mixture and butterscotch chips, whisking to melt the chips and distribute evenly. The vanilla bean was probably too hard to split before, but since it has softened up now, cut it open lengthwise. Using the dull edge of a paring knife, run it down the length of the bean, scraping up all the fragrant vanilla specks, and add it back into the cream mixture. The remaining vanilla pod still has a lot of flavor left, so I like to rinse it off and put it in a jar filled with sugar to make vanilla-scented sugar. Every time you cook with a vanilla bean, just keep adding it to your jar. Now, it's time to temper the hot cream mixture into the egg yolks (add a little at a time so that you don't end up with scrambled eggs). Strain this mixture through a fine mesh sieve and pour directly into a baking dish that is sitting in a larger roasting pan. Bake in a water bath at 350 F (the water should come about halfway up the side of the baking dish), wrapped in foil, approximately 40-60 minutes or until the pudding is starting to set. The pudding is done when it jiggles as one if you move it gently. Remove the baking dish from the water bath and let it cool at room temperature. Strain the custard through a fine mesh sieve a second time and ladle it into your serving bowls (I used round punch glasses; I've also seen some pretty presentations in tea cups before). Chill thoroughly before serving. Instead of making the toffee garnish, I went with freshly whipped cream, chocolate shavings, and a buttery Tahini Shortbread Cookie. The salty, nutty crumble of the Tahini Shortbread was a nice complement here. If short on time though, I would just crush up some Werther's or Skor toffee and sprinkle that on top. I'm pleased to report back that this recipe remix was a success! It had the same swoon-worthy, luxurious texture as Town Hall's original version. The pudding was golden and buttery, and just melted away on your tongue like cool silk. This decadent dessert consists of a rich butterscotch pudding layered over dark chocolate pudding, topped with a buttercrunch toffee. 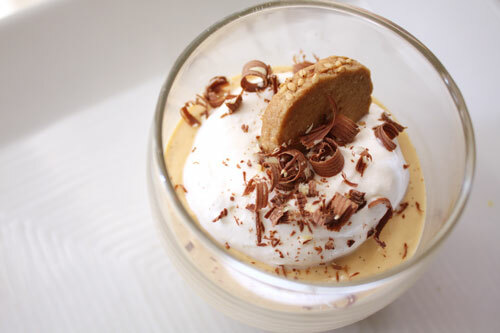 For my version, just make the butterscotch pudding, top with freshly whipped cream, and garnish with chocolate shavings and a Tahini Shortbread Cookie. Recipe courtesy of Town Hall. 1. Whisk together the cocoa, cornstarch, sugar, and salt in the bottom of a dry heavy bottomed medium pot. 2. Add the vanilla bean, then slowly whish in the heavy cream, scraping the bottom with a spatula to make a homogenous mixture. 3. Add yolks, whisking un until completely blended. 4. Pour in milk and whisk well. 5. Cook the mixture over medium heat until it is hot, stirring frequently, then add the chocolate pieces and whisk scraping the bottom to ensure no chocolate burns while it is melting in. 6. Continue to cook over low heat until the mixture thickens and reaches 180 F; it may still look loose – this is ok, it sets up as it cools. 7. 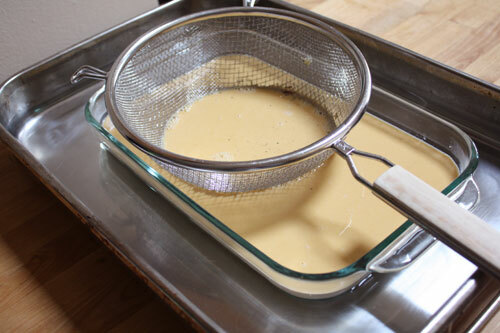 When the mixture is ready, add the butter and strain through a fine mesh sieve into a clean container. 8. Now you are ready to ladle the pudding into your serving bowls. 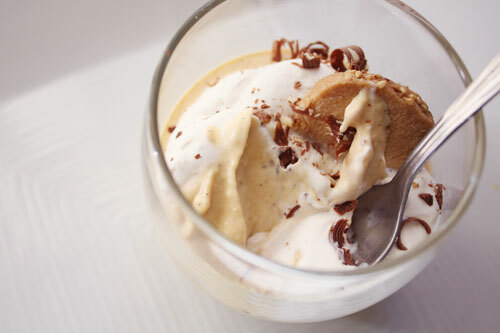 Place them in the refrigerator to chill and set before ladling on the butterscotch pudding. 2. 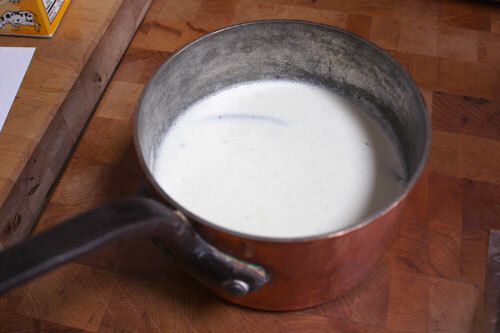 In a medium sauce pan over medium heat, scald the cream (heat just under boiling – small bubbles will rise to the side, but no rolling boil), salt, and vanilla bean. 4. When the cream mixture is done, turn the heat off the pot and stir in the scotch mixture and butterscotch chips, whisking to melt the chips and distribute evenly. 5. Temper the hot cream mixture into the egg yolks (add a little at a time so that you don't end up with scrambled eggs). 6. Strain this mixture through a fine mesh sieve and pour directly into a baking dish. 7. 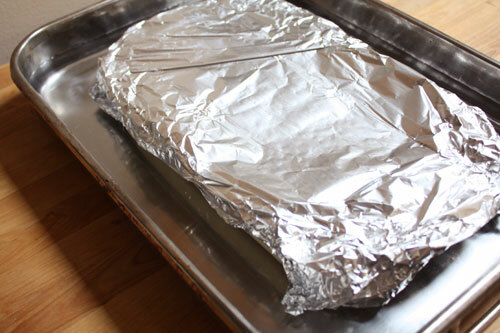 Bake in a water bath at 350 F, wrapped in foil, approximately 40-60 minutes or until just starting to set. The water should come about halfway up the side of the baking dish. The custard is done when it jiggles as one if you move it gently. 8. Remove from water bath and let cool at room temperature. 9. Strain the custard through a fine mesh sieve a second time and ladle into your serving bowls, which have been already filled, and chilled, with the chocolate pudding. Chill before serving. 1. Have ready a large offset spatula and sheet tray lined with a silpat (or parchment paper). 2. Combine sugar, water, corn syrup, and butter in a shallow pot and bring to a boil over high heat. 3. Cook, stirring frequently, until the mixture is the color of peanut butter. 4. Remove from the heat and whish in the salt and baking soda. 5. Pour this out directly onto the silpat and spread out as evenly as possible with your spatula to ensure a thin toffee. 6. Invert the toffee onto another silpat, then remove the mat so as to be sure it is not stuck. 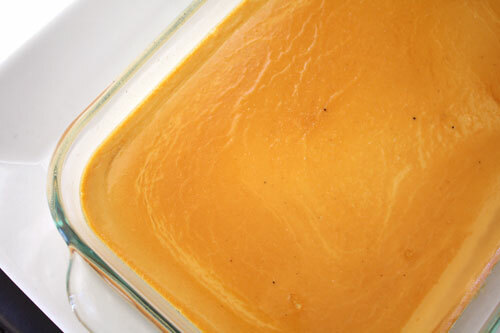 Then invert the toffee again and wipe off any grease that may have formed on the surface with a paper towel. 7. Now pour your tempered chocolate* over the toffee and spread out into a thin, even, layer, and let sit until it is set completely. 8. Break into pieces and use to top your pot de crèmes (keeps in the refrigerator up to 4 days). * At the restaurant we use a very simple technique for tempering chocolate. We fill a metal mixing bowl with our chocolate pieces, and melt it completely by letting it sit on top fo the stove. Using a double boiler works as well. Once you’re sure the chocolate is completely melted and smooth, let it sit in a cool part of the kitchen for about 15 minutes. As the chocolate on the insides of the bowl begin to set up, stir it back into the rest of the melted chocolate and let it sit some more until more chocolate has set on the sides of the bowl. Then stir that in as before. Continue the process of stirring the sides of the bowl until the chocolate until it feels cool on your lip. It will have a nice shine, and register 88 F on a thermometer. You are ready to pour.